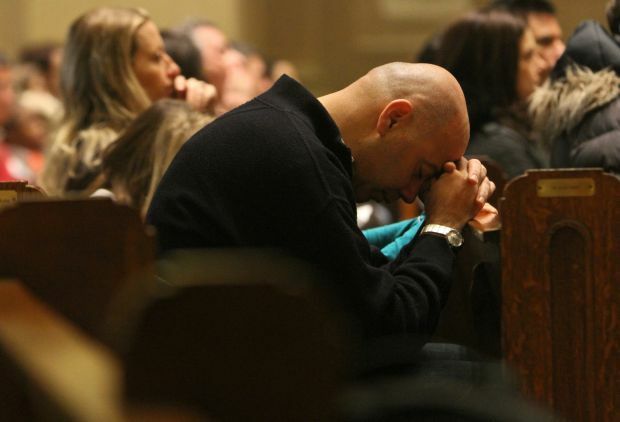 NEW YORK (CNS) — New York’s French Catholic community offered solemn prayers for the victims of the recent terrorist attacks in Paris at an otherwise-joyful family Mass. “Everybody knows somebody who was involved in the massacre. They’re stunned, they’re searching and they don’t know what to do,” Msgr. John N. Paddack told Catholic News Service after Mass Jan. 11 at Church of Notre Dame in Manhattan’s Morningside Heights neighborhood. The parish is the center of the Francophone Catholic community in New York. Msgr. Paddack anticipated that the violence in France will bring some people back to church. “Today I saw people who hadn’t been here in a while and I’ll probably do grief counseling during the week,” he said. He is a counselor and psychologist, with experience in other traumatic situations, including the Sept. 11 attacks in New York. Every summer, Msgr. Paddack serves at Notre Dame de Lorette Church in Paris, not far from the Charlie Hebdo newspaper office where two Muslim brothers forced their way in and killed 12 people. He said French friends there are “totally taken aback.” In addition, his colleagues in Spain and England are “very much afraid” of similar violence.